164 pages | 41 B/W Illus. What is reading? 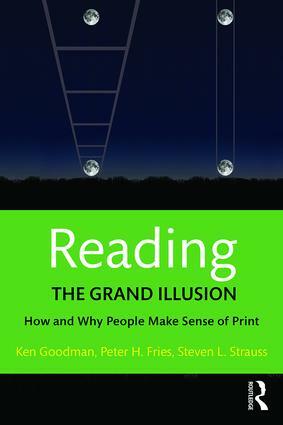 In this groundbreaking book, esteemed researchers Ken Goodman, Peter Fries, and Steven Strauss, explain not only what reading really is but also why common sense makes it seem to be something quite different from that reality. How can this grand illusion be explained? That is the purpose of this book. As the authors show, unraveling the secrets of the grand illusion of reading teaches about far more than reading itself, but also about how remarkable human language is, how the brain uses language to navigate the world, what it means to be human. Each author brings a different perspective, but all share a common view of the reading process. Together they provide a clear and surprising exposition of the reading process, in which they involve readers of this book in exploring the ways they themselves read and make sense of written language while their eyes fixate on fewer than 70 percent of the words in the text. In addition, the authors engage in a cross-disciplinary discussion about how readers use the brain, eyes, and language in reading. The different perspectives provide depth to the authors’ description of reading. The information presented in this book will be new to many teachers, researchers, teacher educators, and the public alike. The final chapter draws on the understandings from the book to challenge the treatment of reading and writing as school subjects and offers the basis for supporting literacy development as a natural extension of oral language development. Ken Goodman is Professor Emeritus, Reading, Language and Culture, University of Arizona, USA. Peter H. Fries is Professor Emeritus, Central Michigan University, USA. Steven Strauss Ph.D & M.D. is a Neurologist, Private Practice, USA.